The route is nicknamed the "Semmering of Banat" because of its similarity to the railway"Semmering " in Austria, built between 1845-1854. A parallel may be draw, taking into consideration the technical characteristics of the two railways and the mountain landscape they cross. 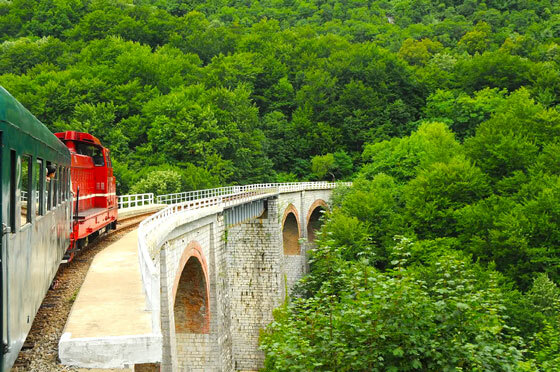 The Semmering railway has a total length of 40 Km between Glognitz-Mürzuschlag) over a level difference of 388 m; in Romania the level difference is of 340 m over a length of 34 km. In Austria 15 tunnels were built, here 14 tunnels. The highest viaduct of the Semmering railway has 47m, Jitin viaduct has 37 m. A significant difference consists in the tunnel length. 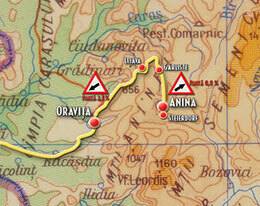 The longest is of 1428 m, while on the track Oraviţa-Anina the longest is of 660 m (Gârlişte). The great craftsmanship of building this railway consisted in its gradient of 20 o/oo compared to other railways which had a gradient of 14‰. Also, the radius of the curves on this railway is of 114 m compared to other railways radius of 150 m. This was why special locomotives and cars were needed. In total, it crosses 843 m over deep valleys, and its tunnels have a total length of 2084 m. The hill needed to be pierced and cut over a distance of 21 km and only on about 10 km the train follows a normal railway. The tunnels were drilled by chisel and pick; the dynamite had not yet been invented back then. The railway Oravita-Anina has a length of 34 km, and its total construction costs amounted to 5.000.000 guldens. In total 10 viaducts over a total length of 843 m, and tunnels with a total length of 2084 m were built and the hills were pierced over a total length of 21.171 m. The crossing over valleys is divided as follows: Oraviţa and Maidan 6 crossings – of which, the longest viaduct is the so-called Racoviţă viaduct with a length of 115 m and a height of 26,5 m; Maidan and Lişava have one viaduct, between Lişava and Gârlişte(Caraşova)there are two viaducts, one of which is the Jitin - viaduct – a true work of art. It has 7 spans and a metallic bridge over a distance of 31 m the outer spans are arched, and both its ends are curved. The radius of the curves is of 114 m, the height of the pillars is of 37,18 m and it runs over a distance of 1.038 m. A particular situation is that of, Garlişte station, where due to the land characteristics, the train coming from Lişava can not directly enter the station, reaching its altitude after it enters the tunnel, follows a manoeuvre on a track which is at a higher level than the current track, and it arrives in front of Garlişte station. 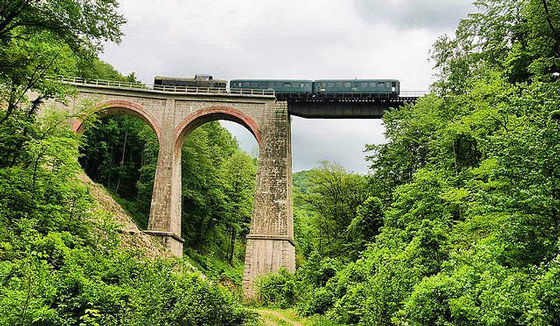 Between Garlişte and Anina, near Anina is the last viaduct, Schlucht viaduct, its core is made of iron and it has a height of 31,6 m and a length of 95,45 m.
The track climbs a slope of 337,7 m from Oraviţa where the station is at 218,7 m above the sea level and Anina which is at 554,4 m above the sea level. There are maintained, in various state of preservation, seven stations and many additional buildings Oraviţa, engine house, small block stations for traffic surveillance, etc. The track has maintained its original route with 14 tunnels over a total length of 2,084 m, 10 viaducts with a length of 843 m, abutments for the slopes with a length of 9946 m and slits in the mountain over a length of 21171 m (over two thirds of the route). The track has never been electrified, up to now working with Diesel locomotive. In Oraviţa engine house, a steam locomotive series 50 000 is kept, which may be reconditioned for a possible reactivation. The CFR regional division Timisoara has carried out consolidation work for Gârlişte tunnel and Coşovăţ viaduct, as well as restoration work for Lişava station. Unfortunately, investments in locomotives and car restoration or in promoting the track for tourists are almost non-existent. The track is in operation, minimum changes being made over time. 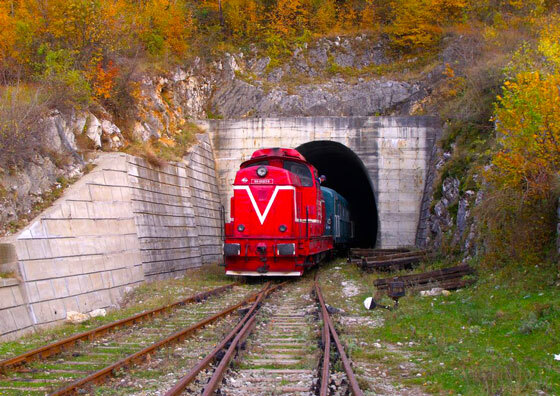 Oraviţa-Anina railway, is unique in our country, as well as in the South-East Europe, it is an “A”-value class historic monument and truly an engineering masterpiece.